A number of Brisbane secondary students have had a life changing experience helping to build new schools for cyclone ravaged Vanuatu. A number of Brisbane secondary students have had a life changing experience helping to build new schools for cycloneravaged Vanuatu – the project described as a significant move for Faith Lutheran College to focus its attention on a community abroad. 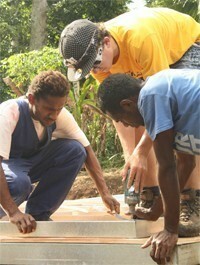 The students exchanged their pens and text books for hammers and nails to help build schools in Vanuatu for children living in third world conditions and made life long friends along the way. For many of the students of Faith Lutheran College in Redlands the journey was their first ever trip outside of Australia. The students raised the funds their own flights to the country as well as the $12,000 to cover the costs of the building supplies they took with them. One of the teachers that led the team of staff and students from Faith Lutheran College to Vanuatu, Sarah Day says it was a great educational and spiritual journey for the students. Day says seeing how different the school systems are and taking part in helping others is a valuable lesson they will keep for life. She says they all feel blessed to meet the wonderful people of Fokona and they are working to build an ongoing relationship with them. 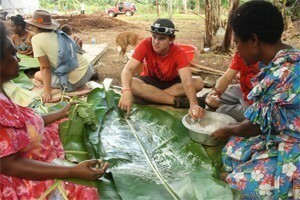 Year 12 student, Alex Boultbee, took part in the school trip to Vanuatu and reveals the impact the travels have had on his perspective of the world. Alex says on day two they were helping to lay the foundations of the very first classroom and the local school and village people of Erakor were so grateful for these new buildings. He says while most of the trip was spent building the classrooms, they also took time to immerse themselves in the local culture. He says he helped some local ladies from the village make a traditional meal called lap lap. Cooking this meal involved actually climbing up the coconut tree to get the fruit and then mixing the milk with rice, plant roots and banana. Alex met a little boy called Vukultab on the first day in Vanuatu and he says he was ‘blown away’ by how little Vakultab and his family had, when visiting his house. He says when they left, he gave all his donations to Vakultab's mother who burst out crying because she was so happy. Alex now plans to sponsor his new friend so that he has enough money to go to school every year. 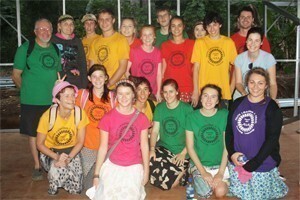 Pro Bono Australia thanks the Faith Lutheran College for providing their photographs and thoughts on their international volunteering experience.